General Electric Co. and United Technologies Corp. both need to release value for shareholders. By coincidence, General Electric Co. (NYSE:GE), and United Technologies Corp. (NYSE:UTX) are both under significant pressure to undertake far-reaching strategic restructurings. Let's take a look at what's going on, and how these changes might affect the investment proposition for each stock. As you can see in the chart above, both stocks have been somewhat disappointing so far this year. General Electric's weak performance has forced management to lower earnings expectations, and question marks have been raised about the quality of GE's earnings. Clearly, new CEO John Flannery has a job to do to restore confidence in the company's strategic direction and its ability to hit earnings guidance. The latter issue could begin to be resolved by Flannery formally abandoning the target of $2 EPS by 2018 -- a figure analysts don't think GE will hit. 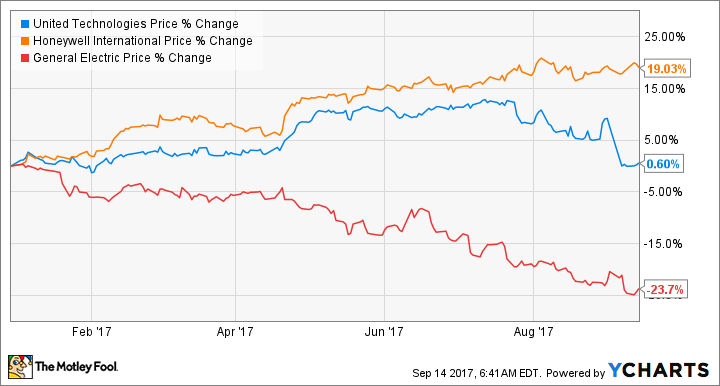 In a nutshell, GE needs to learn a lesson from what Honeywell International's management did following its disappointing earnings in 2016. Turning to strategic considerations, Flannery has promised investors a comprehensive, no-holds-barred review of GE's portfolio. There are reasons to believe that restructuring -- perhaps with a sale or spinoff of a significant business -- would enhance value for shareholders. Of the big four segments, healthcare is the most likely candidate. Power is a core GE business, and management is busy integrating Alstom's energy assets, and driving earnings growth by cutting production costs on the H-class gas turbine. Aviation is also a core business, and cutting production costs on the cutting-edge LEAP turbofan engine, which it's building through its CFM joint venture, will be key earnings driver in the coming years. Meanwhile, the recently closed purchase of Baker-Hughes, which made GE the No. 2 oilfield service provider in the world, suggests management sees oil and gas as an integral part of the company's future. However, selling or spinning off healthcare -- Flannery was formerly the CEO of GE Healthcare -- makes sense for a number of reasons. There is arguably very little cross-fertilization of ideas and technology between healthcare and the other segments, in contrast to how oil and gas, power, aviation, and transportation might, for example, trade insights on turbines and engines. Moreover, a separation would create two companies with differing end-market dynamics and cash-flow-generation properties. This would arguably lead investors to value them higher separately. For similar reasons, GE rival Siemens is on track to separate its healthcare unit from its energy and industrial businesses. In short, a sale or spinoff of GE Healthcare could revitalize confidence in the business, and firmly focus GE on becoming the kind of digital industrial company that recently departed CEO Jeff Immelt dreamed of creating. The stock price chart tells you a lot about United Technologies in 2017. In general, it has been a year of quiet execution on the company's long-term strategic plans. Its Otis Elevator subsidiary is growing unit orders in China, and there has been some relative improvement in pricing conditions. At Pratt & Whitney, the geared turbofan (GTF) production schedule remains on track even as the company still has technical issues to fully iron out. Meanwhile, UTC Aerospace Systems (UTAS) is offsetting weak original equipment sales on legacy aircraft with strong aftermarket sales, and the climate, controls and security (CCS) segment is growing organic equipment sales strongly again -- they were up 11% in the second quarter. In short, the company is broadly on track with its long-term plans, but investors have taken a dim view of its intended $30 billion acquisition of aviation equipment supplier Rockwell Collins. It's a major bet on aerospace, and the combined company will offer a wide range of products from avionics, flight controls, and aircraft interiors (Rockwell Collins) to mechanically actuated systems, aero-structures, landing gear, and aircraft engines (United Technologies). The question is whether United Technologies is biting off more than it can chew with the acquisition. Bearing in mind the ongoing need for execution at Otis, UTAS, and CCS, management has a lot on its hands. Moreover, Rockwell Collins itself has a newly acquired business, BE Aerospace (aircraft seating and cabin equipment) to integrate as well. Moreover, a quick look at United Technologies' overall valuation versus its peers suggests there is an opportunity for management to release value. For example, KONE competes with Otis, Ingersoll-Rand competes with CCS, and Spirit AeroSystems is a major aerospace equipment supplier. 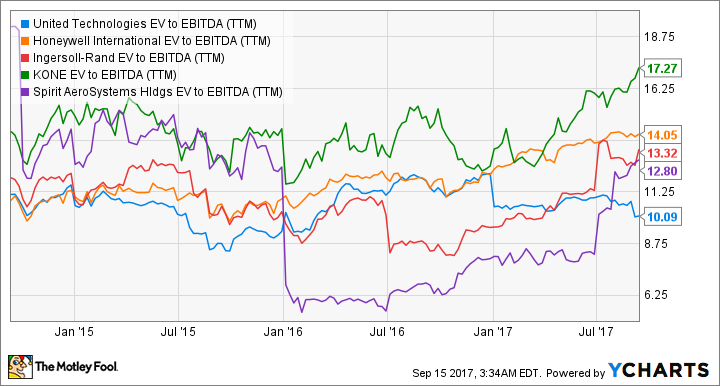 All three trade at higher valuations than United Technologies, while Honeywell's continues to command a premium relative to its rival. In the press release announcing the Rockwell deal, United Technologies CEO Greg Hayes conveyed a willingness to take restructuring actions: "Once we have completed the integration of Rockwell Collins and made progress toward reducing leverage back to historical levels, we will have an opportunity to explore a full range of strategic options for UTC." All told, both stocks have upside opportunities, but there is a key difference. There are reasons to like GE, but in my opinion, it's not worth buying until the conclusions of Flannery's review are released and investors fully understand the direction he wants to take. Any failure to take decisive action could weigh on the stock. The difference with United Technologies is the stock looks a good value with or without significant restructuring. Before the Rockwell Collins deal was announced United Technologies looked undervalued compared to its peers, and management thought so too. The case for buying the stock rests on the idea that the company is going through a couple of years of transition while it's positioning itself to generate long-term earnings and cash flow from the GTF/Otis elevator servicing in China/new aircraft programs--something the addition of Rockwell Collins will help out with. In other words, United Technologies can release value for shareholders with the successfull execution of its existing plans as well as by engaging portfolio restructuring.